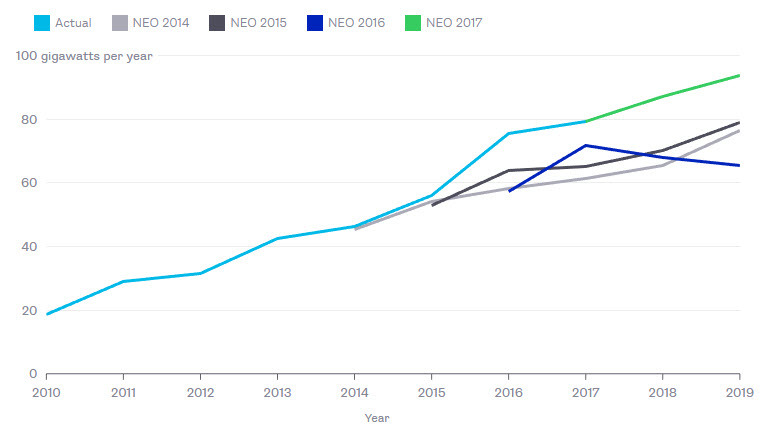 Bloomberg New Energy Finance has just published its fourth annual New Energy Outlook, a comprehensive forecast of the power industry from now to 2040. And every year, it is full of wonders. First among them for 2017 is an extraordinary showing for solar energy technology. Electricity’s future is sunny — and windy, too — to the tune of trillions of dollars of new investment. According to the latest report, $10.2 trillion in power generation technologies will be invested worldwide in the next two decades, of which almost three-quarters will flow into renewable generation sources. Wind power will garner more than $3 trillion, and solar power will attract more than $2.5 trillion. Nuclear power and hydroelectricity will each get more than $1 trillion in new investment, but gas will only draw $804 billion, and coal even less — $664 billion. Note: “Everything else” includes geothermal, biomass and oil-fired power. While wind is tops in dollars, solar continues to decline in cost, and that means it will pass nuclear generation capacity this year, wind in 2022 and gas in 2031. 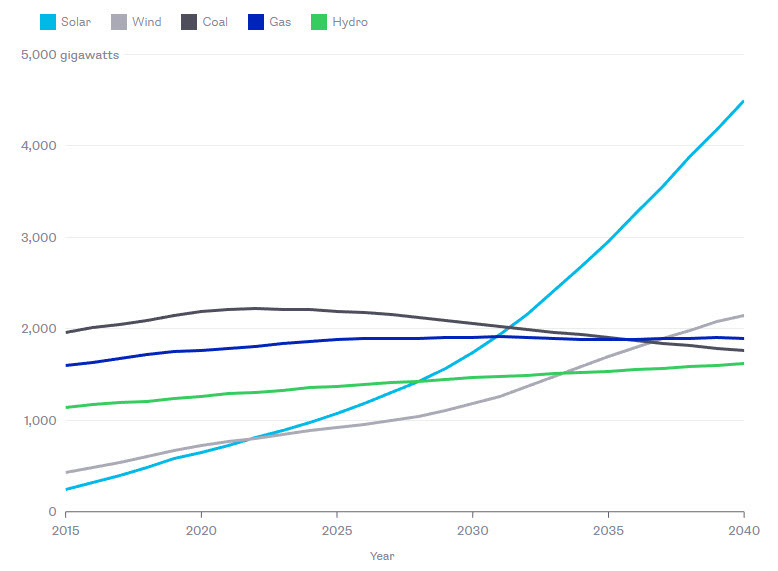 In 2032, solar capacity will exceed coal-fired power generation capacity, and it is the single largest source of capacity (though not of electrons) on the global grid. Solar doesn’t stop there. In 2039, solar capacity will exceed all fossil fuel capacity. Note: “All other renewables” is wind, geothermal and biomass. 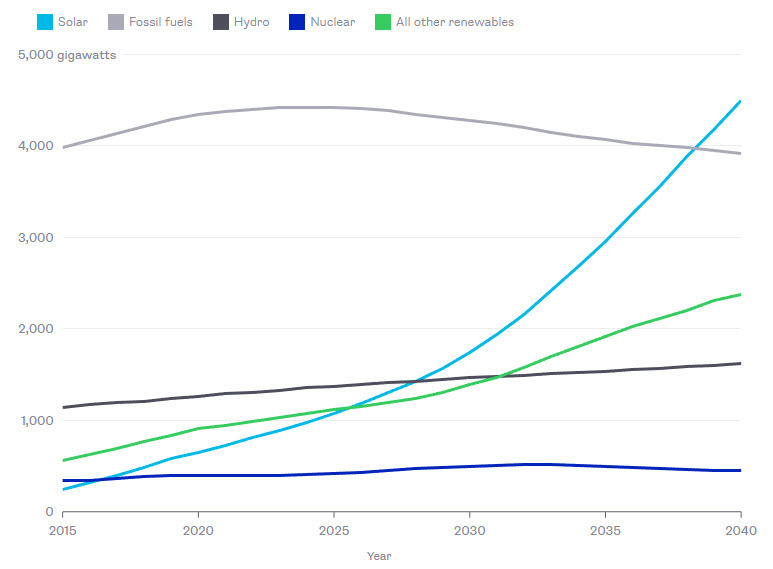 What energy mix does that give the world by 2040? A very different one from today’s. Last year, renewables made up 26 percent of all electricity generation, and fossil fuels 64 percent. In 2040, renewables will provide 51 percent of all electricity generation, and fossil fuels will be 40 percent. Next week I’ll look beyond what will be built in the next 20-plus years and into what the emerging power mix means for the companies and markets in the world’s future electricity system. Get Sparklines delivered to your inbox every week. Sign up here.